Christmas is approaching... I am never all entirely organized when it comes to my shopping, but really who is? One thing I always seem to be on track with are stocking stuffers! Since I was in high school, stocking responsibilities have been mostly mine. I shopped for stuffers, stuffed them and placed them in the appropriate spot. You see, we like to really pack our stockings full, so they could never really hang. Instead, they're loving placed in the recipient's Christmas morning seat. Now, there are rules when it comes to stockings (at least in our family, there are.) We tend to not go for 'crap'. Of course there can be exceptions, but for the most part we try to keep stocking goodies to things that are actually going to be used and enjoyed. We also set a price limit. Anything over $15-$20 does not belong in a stocking. It just doesn't! I get slightly baffled when I see $50 items on 'Stocking Stuffer' lists. That's a full on gift in my book. I've compiled a few of my picks for the perfect stocking, and a couple goodies you can pick up for yourself when you're out and about. Just tell everyone they're from Santa! That is also a tradition in our house, you can totally cheat and get yourself a little something IF you wrap it and make that it came from the jolly one. Who in their right mind can resist the scent of chocolate chip cookies? That's right, no one. It doesn't hurt to have spankin' clean hands either. "I love you, and I want you to be able to have bangin' lipstick at all times." Might just be what this little gift would say, if it could talk. A super shiny gloss that isn't tacky? You bet. It even has the sweet scent of apricot jelly. Christmas can be rough, there is no need for your skin to be too. When it comes to candles B&BW can almost do no wrong- I say almost because I've yet to have a mini that burned well. Anyway, everyone can agree that a warm, flickering candle on a cold night is pretty much always a good thing. I've recently come to love - it's almost obsession, but whatever- this style of lash curler. The open sides make it virtually pinch free. Everyone with lashes needs one! Holidays=Glitter. It's a mathematical fact. Let Sephora inject your merriest moments with a fine gold or silver shimmer for hair and body. This little set includes Korres Guava Body Butter and Pomegranate Lip Butter. Who wouldn't melt (get it...? Butter. Melt?!) for this? It's on the higher end of the budget, but I say totally worth it. I don't have a whole lot of experience with Too Faced products, and that is something I'd like to change. This set contains minis of some of the brands most popular products. A cute little set including three bath goodies: The Comforter Bubble Bar, Butterball Bath Bomb, and So White Bath Bomb. Perfect for a little bit of post shopping relaxation. It seems almost cliche to love red velvet, but it's so delicious! Add the goodness of red velvet to a lip scrub and I'm all over it. Totally indulgent, but everyone needs a little splurge every now and then. 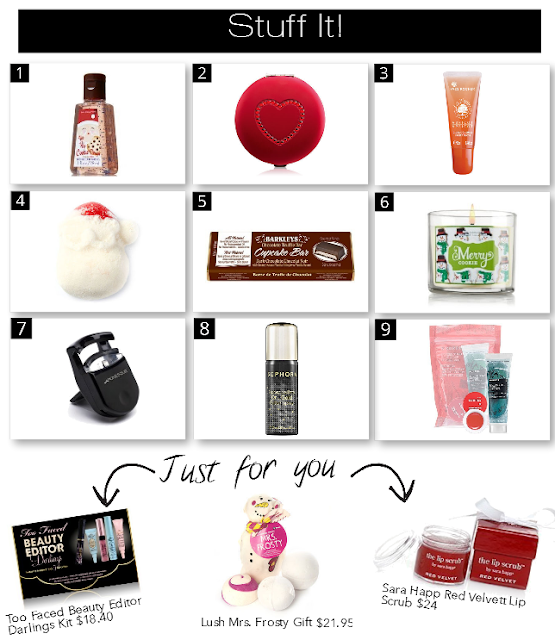 Do you like shopping for stocking stuffers or are you just all about opening them? What would love too see in yours this year?